Try a new way to enjoy our vast and untouched landscape. With our silent dogs you will have the feeling of being in the middle of nowhere as we are away from the big tourist areas. But when looking around you might see moose, reindeer, grouse and fox or at least the traces they have left behind. Did you know you can run on water? 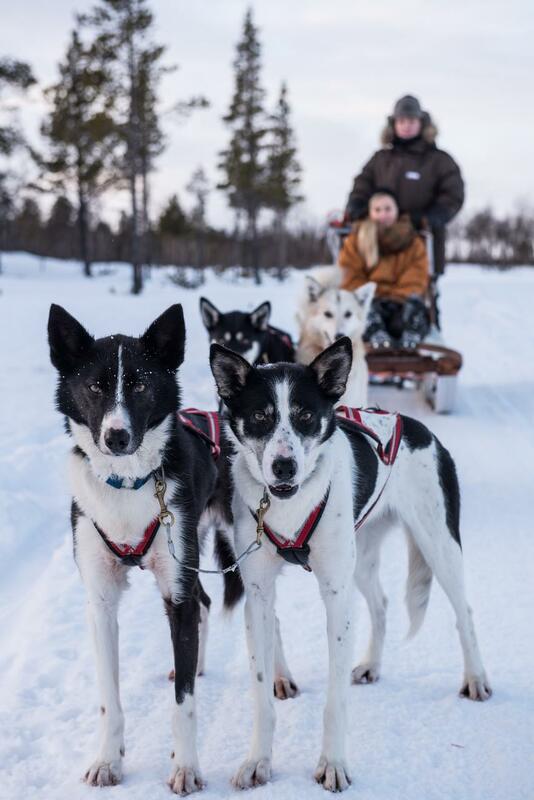 We go with the dogs on the River Kalix, which is one of the largest river systems in Europe that has not been exploited for hydroelectric purposes. The river is an important migration route for many migratory birds and it is also an important reproduction area for salmon and trout. Although this is a remote area people have made their living here from fishing and reindeer herding hundreds of years. In clear weather we have a magnificent view over Sweden’s tallest mountain. We have groomed trails but as we are surrounded by mountains, the weather and conditions can change quickly. This contributes to the authentic experience. And we guide you safely through any weather conditions. We want our dogs to blend in with this untouched landscape therefore, with us, calmness, harmony and our dog philosophy are in focus. Here you will learn how to handle the dogs in our way, where energies and meditation are important elements. Before we get off you get a proper driving lesson. Two people share a team of 4-6 dogs and take turns driving. Tension and concentration in driving, in perfect combination with sitting relaxed and enjoy the landscape from the sled. Back at the kennel, everyone helps to massage the dogs, a great way to meet our, and the dogs' needs, of cuddling. After the massage we invite you for lunch in our home. Overlooking the River Kalix and the mountains, fantastic meetings are held around our kitchen table. The journey also offers fantastic opportunity to see Kebnekaise, Swedens Highest Mountain. And we can also alomost guarentee you will see Moose along the drive, as the area is thriving with them during this season. This is more than just a tour you are on, it's a tour you are a part of. It is a learning experience and adventure of a lifetime! To book this tour you must be able to speak and understand English, French or German. It is very important to understand the driving instructions for everyone's security. If the guides think you do not understand properly we have the right to tell you to join the tour sitting on the sled driven by the guide. Pick up from Camp Ripan, Kiruna. Minimum age 16 years. Dates: Daily 1 Dec - 30 March.